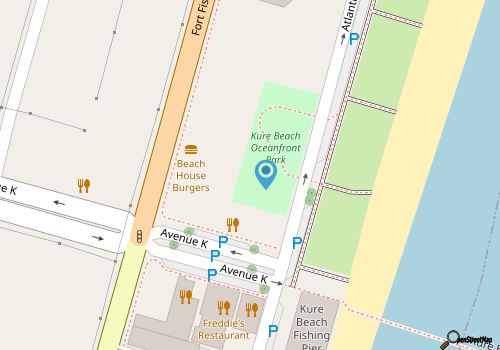 Kure Beaches' newest local hotspot is the Kure Beach Ocean Front Park & Pavilion, a small but welcoming local venue that beacons fans of summer farmer's markets, live concerts, and special, private events in a stunning location. The addition of the park was part of an Atlantic Avenue "facelift" which replaced older beach accesses and walkways with newer, sturdier boardwalks, and concrete sidewalks with sloped asphalt to increase storm water drainage within the town. 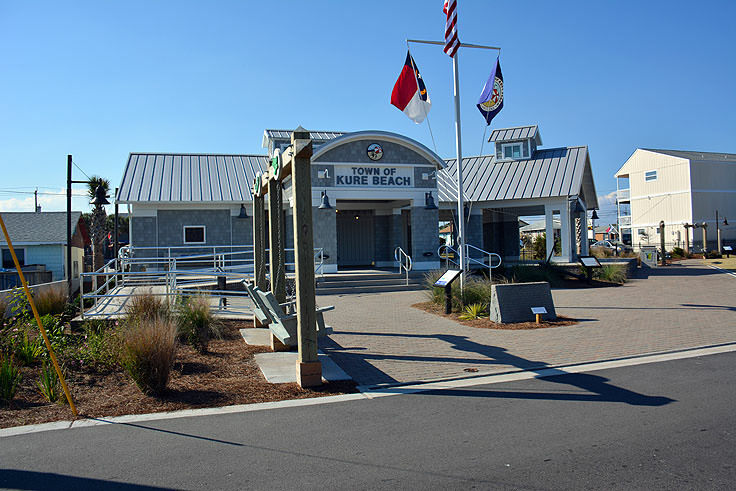 The hallmark of this community-wide project, however, is the new Kure Beach Ocean Front Park & Pavilion, which officially opened for visitors during a weekend long festival in April 2013. 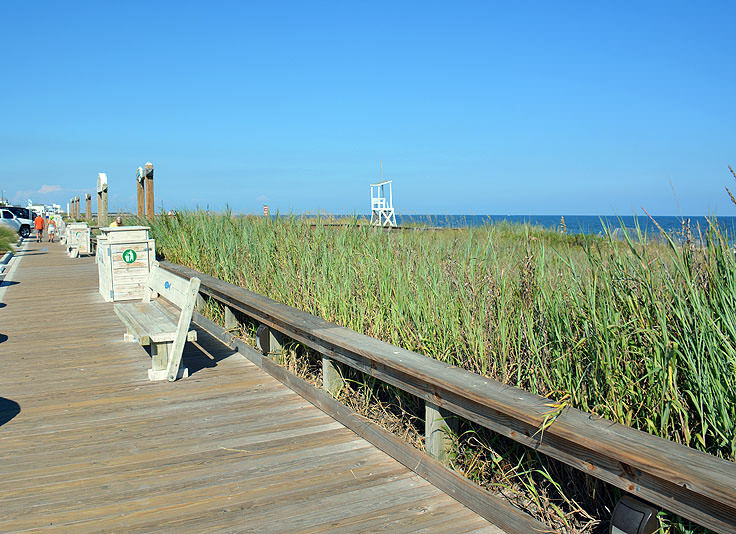 The park has a world of amenities for visitors, not the least of which is its fantastic location just yards away from the Atlantic Ocean beaches. With a line of parking spaces located in between the park and the public beach access walkways, visitors may have a hard time deciding whether to hit the beach, or head to the grassy park grounds for an afternoon of outdoor fun. The park itself features a playground, benches, swings, rain gardens, oceanfront benches and public restrooms, as well as a special "tot lot" playground for children ages 3 to 6 with coastal accompaniments including a pirate ship, fish, and turtle, which are just big enough for little visitors to climb and explore. The biggest attraction however is easily the outdoor venue area, which is a modern covered pavilion and stage that fits right into Kure Beaches' coastal atmosphere. Home to a variety of summertime special events, including live outdoor concerts, open air markets, and other seasonal entertainment, the Ocean Front Park Pavilion is rapidly becoming the hot spot to be on a Kure Beach summer Saturday. Past popular events include children's story hours, "Art in the Park" markets, fitness classes, Tuesday farmer's markets, and free local band performances on the weekends. For special music performances and story hours, attendees are encouraged to bring along their own beach blankets or beach chairs to relax with the sea breeze in the background, and enjoy the show. A complete list of upcoming events at the pavilion can be found on the Town of Kure Beaches' website. The public restrooms are open from 8:00 a.m. to 5:00 p.m., from March until December, with extended hours until 9:00 p.m. during the busy summer months.